LAUSD’s Open Enrollment applications are now being accepted for the 2015-16 school year and there are a number of big changes this year! •Apply any time between May 4-22. Deadline May 22, 2015! •You will hear initial application results by June 9th. Every year LAUSD faces handfuls of seats at under-enrolled schools that are available for those who want them and apply for them. Easier than a work or childcare permit, Open Enrollment seats are up for grabs and once admitted into a school through this type of transfer, your child can stay until they complete the final year it offers. No annual renewal, no proof of residency/employment/licensed childcare paperwork to agonize over, and no lengthy application or approval process. To get started, you’ll have to log in or create a new parent registration with LAUSD. (Hint: it’s the same portal where your eChoices/Magnet application history is, if you did that this fall.) Once you set that up you’ll be able to register your children and check their status for eChoices/Magnets, Open Enrollment, Schools for Advanced Study/SAS, Zones of Choice, and other permit requests, as well as be able to accept or decline potential offers online. If you’ve never done this before, let me walk you through it. 1. Create an LAUSD account at apply.lausd.net. Click on the link to “Create a New Parent Account.” You’ll enter your email which will also become your username. 2. Check your email for the confirmation email from ApplyforSchools@lausd.net. You’ll have to click on the link they send you to agree to terms and activate your new account. 3. Create a password and fill out your Parent Profile. 4. Then add each of your children with the info they request. 5. Once all that’s set up, you can apply for Open Enrollment for each child right there from the drop down menu – which also includes late Magnet-Space Available and Incoming Inter-District Permits (from another District into LAUSD) application links. Each sibling needs a separate application. The site will automatically filter for grade-appropriate options. 6. The online Open Enrollment application lets you select up to 5 school choices, however keep proximity in mind when selecting schools as no transportation is provided. Deadline to apply is Friday, May 22, 2015. Instead of lotteries being held on hundreds of separate campuses, the District will now centralize the Open Enrollment application process into one online lottery. 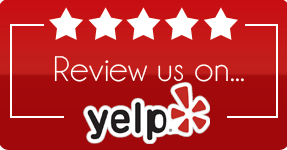 Results are random, non-biased, and will go out via email (and be posted on your online portal) by June 9th. If there are more applications than seats available at a particular school, remaining students will be sequenced into a waitlist in the order they are drawn. If more seats are available than applications, any remaining seats will stay open and available until the process closes on September 3, 2015. ***Note: If your child receives more than one offer of enrollment, please notify the schools you are declining so they can offer the spot to the next student on the waitlist. If one sibling is drawn, all other siblings who applied to the same school will automatically be granted a transfer. After initial offers are made on June 9th, any additional offers on remaining seats will be made in order of the waitlist until all seats are filled or the program closes on September 3rd, 2015. Open Enrollment transfers are good with no annual renewal needed and no fear of being booted off the island until the completion of the last grade offered, typically 5th, 8th or 12th grade. However, you will need to reapply for the next tier (from elementary to middle, or middle to high school) as there are no feeder pattern guarantees with Open Enrollment. 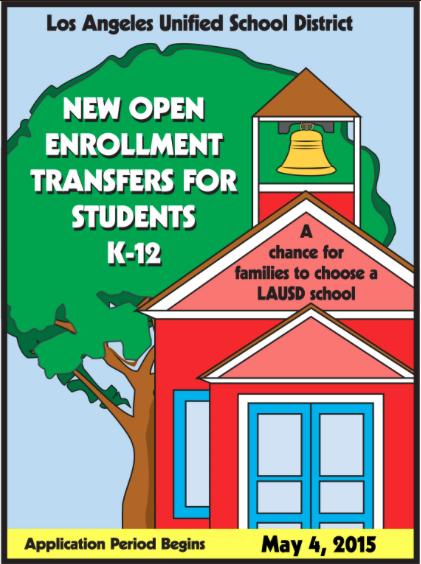 Open Enrollment options are for LAUSD neighborhood schools with available seats. You will never find magnets or charters on that list. Hope you found this helpful. As always, should you need additional personalized assistance, please consider a phone or in-person consultation with me. Best of luck and happy school hunting! GoMamaGuide Profiled in the LA Weekly! Thrilled to be profiled in a piece in the LA Weekly outlining the daunting task of navigating your public school options within the LAUSD! “It’s that day of the year again – out come the shiny new sneakers, brightly colored backpacks, and paper-bag lunches. Today, more than 640,000 kids from kindergarten through grade 12 return to school as the LAUSD opens its doors for the first day of instruction. With nearly 900 public schools and 187 public charter schools, LAUSD’s students make up the second largest school district in the nation, supported by an annual operating budget of more than $6 billion. But that doesn’t mean all students are receiving an equal education. There is a broad range in the quality of teachers, programs and instruction within the district. Some schools are among the state’s best. Others struggle. The truth is that even once you’ve settled on public schools for your kids, selecting the right one within LAUSD isn’t easy; it involves navigating a complex and confusing system of applications and requirements. It’s enough to make many parents give up. Thanks to reporter Chris Walker- who’s got a cool story of his own – who heard me on Warren Olney’s show the week before and sought me out for the story! Hot Off The Presses! 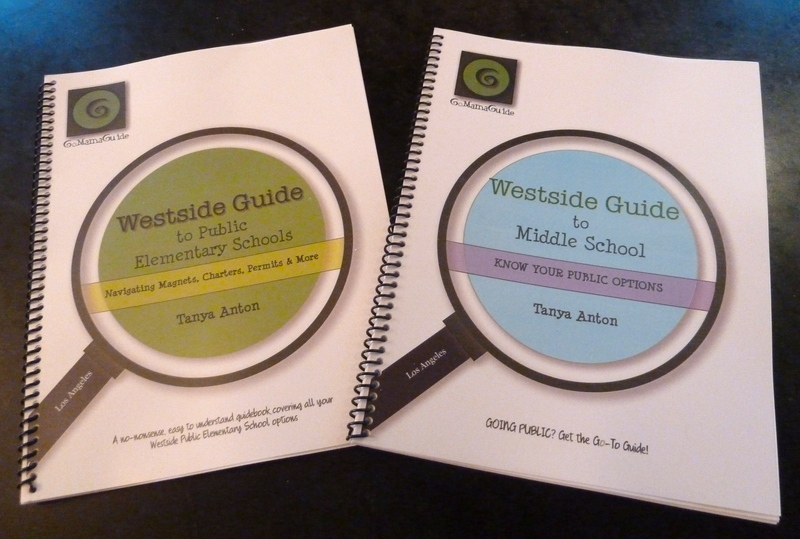 New School Guidebooks for 2014! newly revised and updated for the 2014-15 school year! $20 each. Click HERE to purchase.